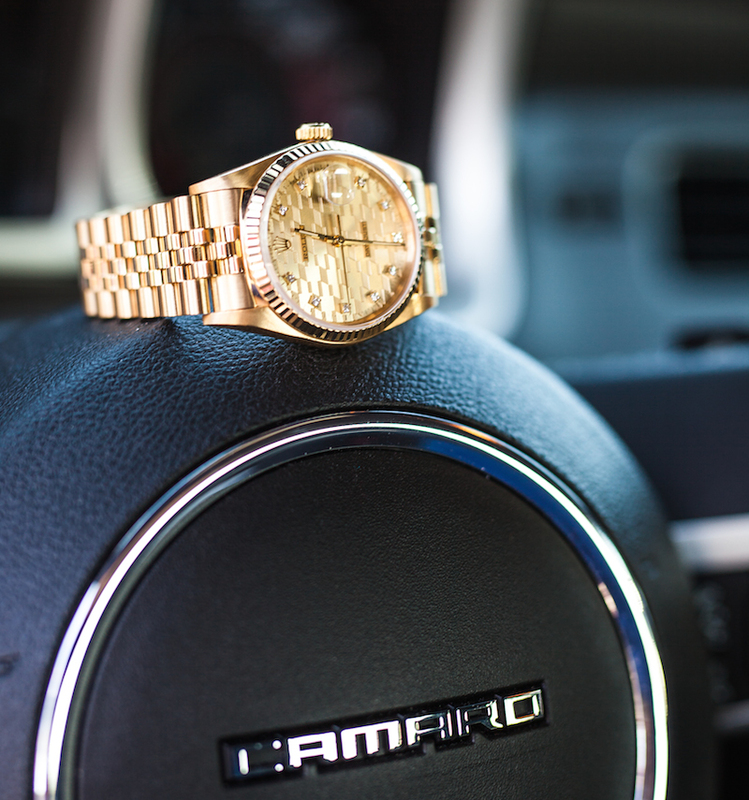 Rolex Datejust 16018 with Chevrolet Anniversary Dial in gold. 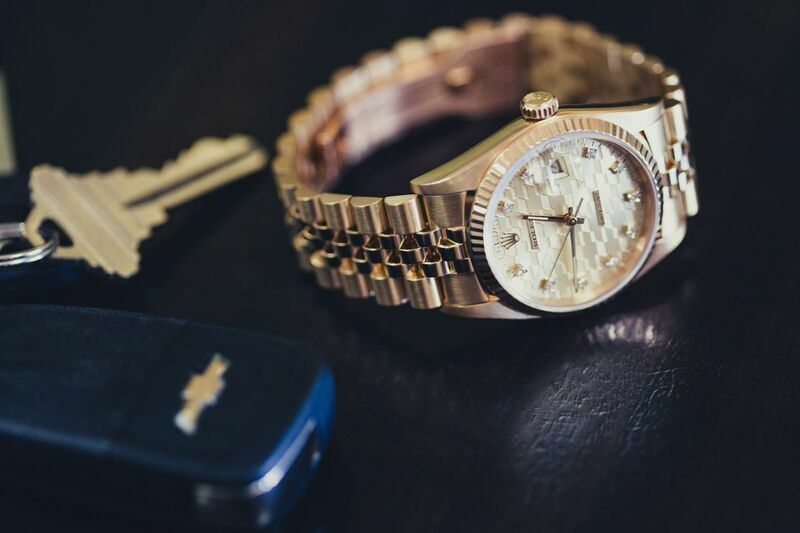 Owing to its prestige and stellar reputation, a Rolex watch has often been gifted as a celebratory piece, especially during a career milestone. 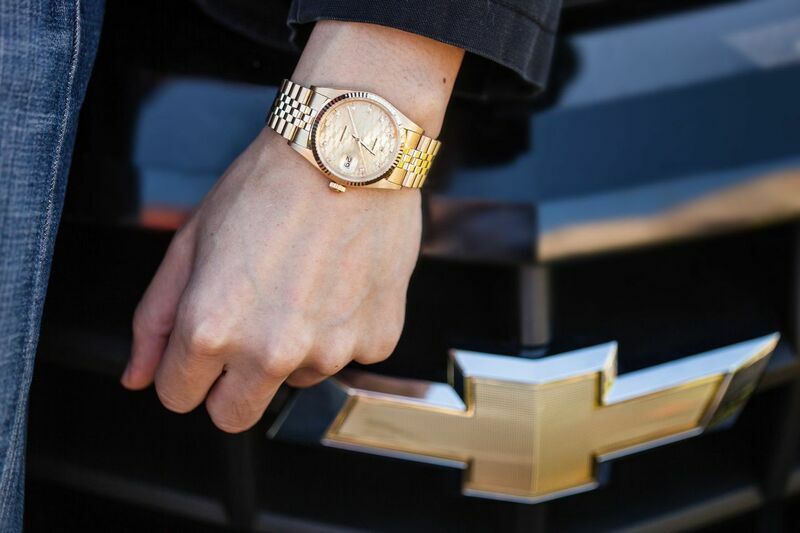 So it does not come as a surprise that for its 75th anniversary in 1986, Chevrolet chose to commission an exclusive Rolex piece to honor the momentous occasion. A Rolex Datejust 16018 with Chevrolet Anniversary Dial is very rare, it also was the result of the company’s 75th anniversary. The model selected by the car manufacturer was the 18k yellow gold Rolex Oyster Perpetual Datejust ref. 16018 and it was furnished with a dial exquisitely engraved with a pattern made with the Chevrolet logo. Although Rolex has included corporate logos on their watches before, it had never been done this intricately before. Looking at the exclusively designed dial, the Chevy logo works harmoniously with the rest of the Rolex. As to not take away from the repeating pattern, only two lines of text were placed on the dial: “ROLEX” and “DATEJUST” applied onto mini golden plaques. Since a 75th anniversary is also referred to as a “diamond anniversary”, the addition of ten diamond hour-markers is both significant and, of course, luxurious. 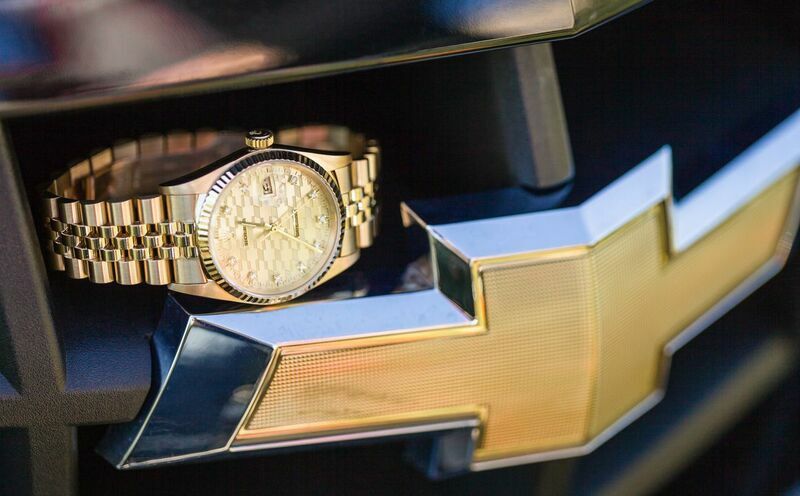 As a token of gratitude, Chevrolet awarded the commemorative Datejust pieces to Chevy dealers with outstanding sales records. As the 75th Anniversary, the “Diamond Anniversary”, it’s only fitting to have diamond hour markers. Being a Datejust 16018, the Chevy anniversary watch sports the distinguished 36mm Oystercase with a screw-down crown for optimal water resistance and topped with an 18k yellow gold fluted bezel. Protecting the face of the champagne dial is a scratch-resistant sapphire crystal fitted with the Cyclops lens to magnify the date aperture at the 3 o’clock position. 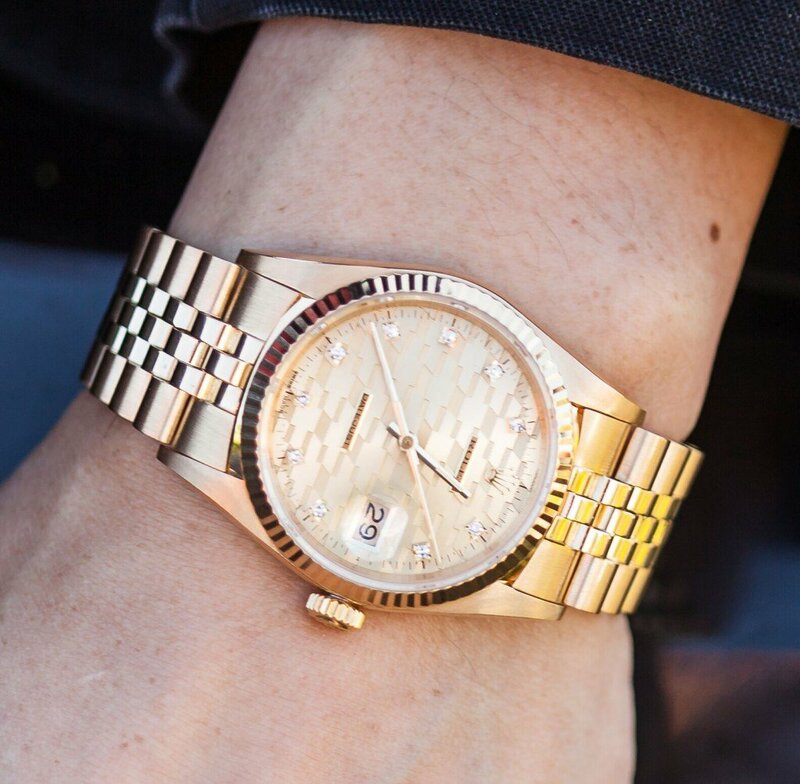 The classic Rolex timepiece is presented on an 18k yellow gold Rolex Jubilee bracelet – originally designed for and unveiled on the inaugural Oyster Perpetual Datejust in 1945 – with its five-piece metal links configuration and iconic Crownclasp. Rolex Datejust 16018 with Chevrolet Anniversary Dial has an 18k yellow gold bracelet. The engine beneath the hood of the Chevy Rolex is the proprietary Caliber 3035 automatic mechanical movement, conceptualized and assembled entirely by the Swiss watchmakers within their ateliers. The perpetual movement drives the hour, minute, seconds and date functions, and offers its wearers the uncompromising reliability and precision one has come to expect from Rolex. The engine beneath the hood of the Chevy Rolex is the proprietary Caliber 3035. The collaboration back in the mid-1980s between the two mega brands to celebrate a leading American car manufacturer’s anniversary with a creation from the leading Swiss luxury watch manufacturer produced a particularly exceptional watch. Only a limited quantity was ordered by Chevrolet from Rolex, thus, these pieces are very unusual to come by. Distinct, rare, and backed up with a great story of how it came to be, this vintage Rolex watch is one to admire.